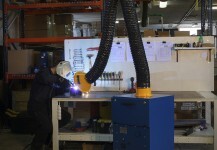 Oskar Air Products offers mobile cassette and cartridge filters for welding, grinding, cutting. Our mobile filters are used mainly in heavy industry for smoke, fume and dry dust applications. 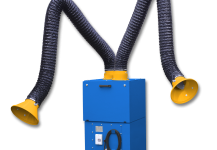 Our mobile filters are available with or without self-supporting fume arm for at-source point extraction. Mobile cassette filter unit one work place for sporadic welding work. Boxair M1 – mobile cassette filter unit one work place for less demanding applications. Mobile cassette filter for two workplaces or inlet connections. Recommended for less demanding applications. Versatile construction. Practical top of the filter. Two inlet connections. Self-cleaning cartridge filters. 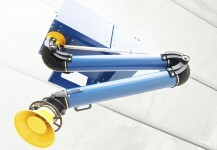 Designed for Oskar 160 hanging arms or top of exhaust enclosures. Self-cleaning cartridge filters. Mobile self-cleaning cartridge filter unit for one arm. 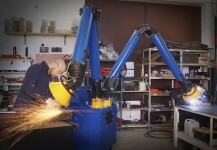 Highly efficient mobile with cartridge self-cleaning system, for for two 160 mm diameter or on 200 mm arms.